I was called out to inspect a Costa Mesa skylight to try and figure out why the customer's ceiling was damaged by the edges of his skylight. After seeing the interior and assessing if he should call his insurance company or not I have to go up on the roof. 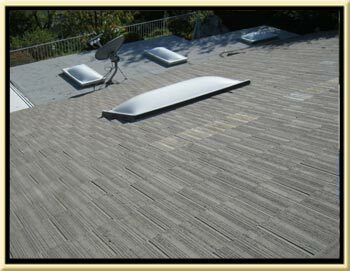 Going up on the roof is always necessary if it can be safely done and if the roof is dry it should be safe. Getting a quote from someone who won’t get out his ladder and take the time to go up on the roof should be a red flag. 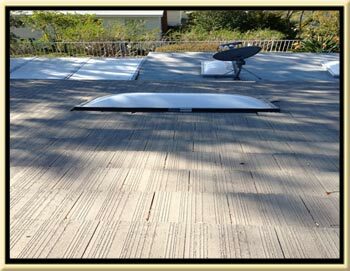 When I go up on the roof for a roof leak inspection I am looking for broken tile, missing roof flashing, cracked or leaking skylight domes, or a sloppy roof install. The picture to the right shows what I first saw. The area around the roof had no apparent “visible” roof damage. I didn’t find any broken tiles, the skylight itself was in good shape, and all of the flashing around the skylight was there. If your skylight flashing is leaking don't waste your money paying someone to try and caulk it. 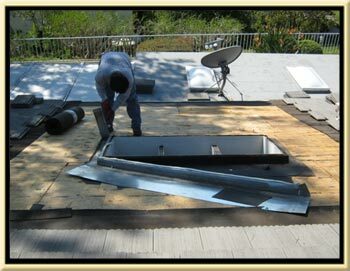 You need your skylight flashing properly replaced. The picture you see to the right is not the before picture but the after picture. 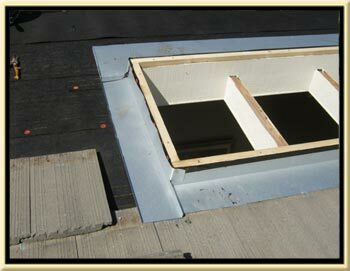 About the only hint that we repaired this skylight in Costa Mesa, Ca. is that you can see some lighter colored tiles right behind the skylight. The roof tune-up work that we did after we finished this skylight repair was painting all of the roof flashing with Behr, Ultra, Paint and Primer paint that we custom matched a color for the roof (you should never let a roofer use spray paint on your roof) and we replaced and broken tiles, repaired and reset al slipped tiles, installed new mortar where the old was cracked or damaged, and left his job the same day we started looking like we had never even been there. If you live in Costa Mesa, Ca and you are experiencing some damaged or a wet ceiling around your skylights then give us a call and we will come out and do the exact same job for you and your skylight leaks will be gone. 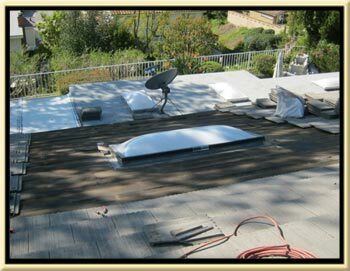 We are a small roofing company that focuses on quality not quantity and offer the best possible prices we can with the maximum amount of professional service and attention the detail.